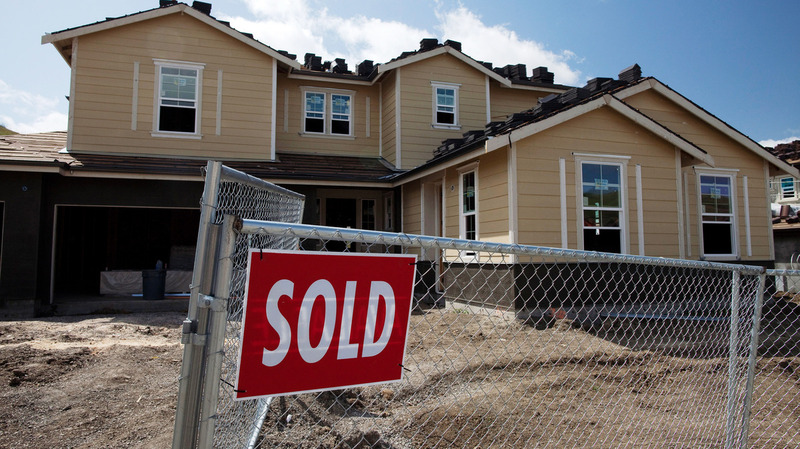 New Home Sales Dipped A Bit In October, But Were Well Above Year Before : The Two-Way Though the pace dipped 0.3 percent from September to October, it was up 17.2 percent from September 2011. It's another sign that the housing sector is on the mend, though growth has been somewhat uneven. A sold sign at a new home site in Danville, Calif., earlier this year. Sales of new homes edged down 0.3 percent in October from September, but were a healthy 17.2 percent above the pace of October 2011, the Census Bureau and Department of Housing and Urban Development report. It's another in a recent series of reports that signal the housing sector is on the mend. But, as Bloomberg News says, the improvement has been somewhat uneven. According to the agencies, new homes sold at an annual rate of 368,000 last month. One thing to keep in mind: Superstorm Sandy struck just as the month was ending and that may have affected the sales pace.